ony be secured via insurance, a bond, or with assets. 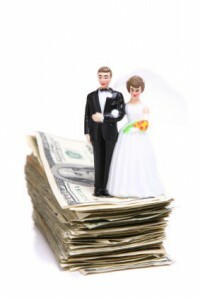 What Does the Court Consider When Deciding Whether to Award Alimony? To determine whether alimony should be awarded, the court must find that one spouse has an actual need for support and the other spouse has the ability to pay. If alimony is appropriate, the court must decide the form and amount to be awarded by considering all of the following factors: (1) standard of living during the marriage; (2) length of the marriage; (3) parties’ age and condition (physical and emotional); (4) all financial resources available to the parties; (5) each party’s education, skill, and earning capacity (or time required to attain education/training to obtain employment); (6) each party’s contribution to the marriage by homemaking, child-rearing, or the other spouse’s education or career-building; (7) what responsibilities the parties will have to the minor children they had together; (8) the alimony’s possible tax consequences; (9) all income available to each party; and (10) any other factors necessary to do equity and justice. The length of a marriage is measured from the date of marriage through the date on which the divorce is filed. There is a rebuttable presumption that a marriage of less than seven years is short-term, a marriage of more than seven years but less than seventeen years is of moderate duration, and a marriage of seventeen years or longer is long-term. Temporary Alimony – Support paid to a spouse while the divorce is pending. Bridge-the-Gap Alimony – Support to help a spouse transition from being married to being single by providing for legitimate and identifiable needs (such as obtaining housing). Bridge-the-gap alimony cannot be awarded for more than two years, cannot be modified, and terminates upon either party’s death or the recipient’s remarriage. Rehabilitative Alimony – Support to help a spouse become self-supporting by redeveloping previous skills/credentials or acquiring education, training, or work experience to develop new skills/credentials. A specific rehabilitative plan (that should include the goal, cost, and time needed) must be established. Rehabilitative alimony may be modified or terminated upon a substantial change in circumstances, noncompliance with the rehabilitative plan, or completion of the rehabilitative plan. Durational Alimony – Support for a spouse for a specific amount of time (not to exceed the length of the marriage) that can be awarded in short term marriages, moderate duration marriages, and long term marriages when permanent periodic alimony is inappropriate. Durational alimony can be modified as to amount upon a substantial change of circumstances and as to length upon exceptional circumstances. Durational alimony terminates upon either party’s death or the recipient’s remarriage. Permanent Periodic Alimony – Permanent support for a spouse that continues until either party’s death or the recipient’s remarriage. Permanent alimony can also be modified or terminated upon a substantial change in circumstances or upon the existence of a supportive relationship. While most commonly awarded in long term marriages, it can be awarded in moderate duration marriages and, if exceptional circumstances exist, in short term marriages. Florida also has lump sum alimony, which is not a form of alimony but, rather, a form of payment that can only be required when necessary for support purposes (to accomplish a form of alimony) or to equalize equitable distribution. Lump sum alimony can be paid with money or via a property interest. If lump sum alimony is awarded for support purposes, then unusual circumstances must exist which require the support award to be non-modifiable. Lump sum alimony vests immediately, is non-modifiable, and does not terminate.